A 440Hz Here is a movie of a tuning fork being struck. It is tuned to A above middle-C on the piano. C 256Hz Here is a second larger tuning fork made of the same material. It's tuned to middle-C on the piano. How does its sound compare to the previous one? Is its pitch higher or lower? What do the equations predict? Guess Here is another tuning fork that's smaller than the other two. Will its pitch be higher or lower? 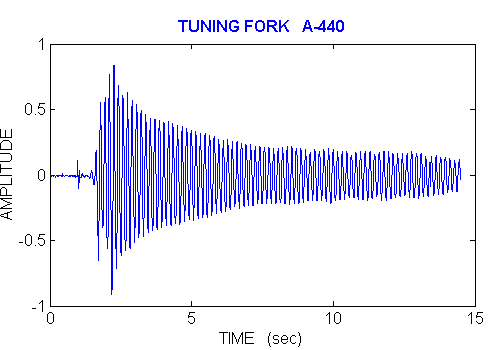 Guess Again Here is the sound of one of the tuning forks? Which one is it? Here is a plot of the last sound from above. The sound you heard gets softer as time goes on, does the plot show this? Here is another plot that's a zoomed in version of the one above. 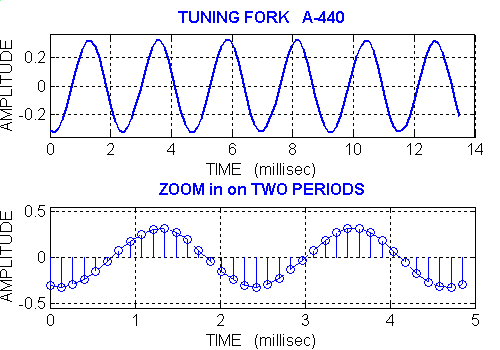 What is the frequency of the tuning fork? You can compute it by measuring the period from the plot. How close is your answer to 440 Hz ?